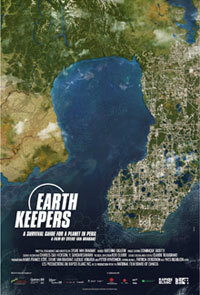 EARTH KEEPERS takes viewers to the four corners of the earth with environmental activist Mikael Rioux. The angry young man who staged a sit-in suspended over the Trois-Pistoles River in Canada to save it from being dammed has grown into a young father concerned about the world he will leave to his son. Mikael meets a man who will become his mentor: eighty-year-old Christian de Laet, a pioneer in the Canadian environmental movement, who suggests that Mikael undertake a global quest to meet key visionaries behind innovative projects with promise for the future of our planet. Mikael discovers seven exceptional men and women who, in addition to their scientific and academic qualifications, each have more than 20 years' experience in putting their theories into practice, finding concrete solutions to environmental and social problems. Mikael first talks with Canadian ecological designer John Todd, hailed by MIT as one of the top 35 inventors of the 20th century. In Sweden, he meets Karl-Henrik Robert and discovers The Natural Step (TSN), a framework developed to help organizations incorporate the cycles of nature into their management practices. In the United States, he encounters Wangari Maathai, the Kenyan Nobel Peace Prize winner and founder of the Green Belt Movement. He also seeks out India's Ashok Khosla, president and co-founder with Christian de Laet of Development Alternatives, the largest alternative development NGO in the world; Nancy Jack Todd, co-founder of the avant-garde New Alchemists movement; Marilyn Mehlmann, the driving force behind the Global Action Plan; and the humanist economist Peter Koenig. Inspired by these visionaries and by his mentor, Mikael returns home with a sense of urgency but also of confidence. He too has become someone who will pass on innovative ideas and clear-eyed hope to future generations.